This friendship is an example of a great team that gets very united during hard times but can be quite distracted during the good ones. If these two friends can overcome their differences, their connection is sure to last because the Cancer is very loyal and always knows what to say in difficult times. In return for being so supportive, the Aries always admires and encourages the Cancer to be him or herself. However, it can be difficult for the Ram to support the Crab all the time because the latter is too moody and doesn’t follow a pattern when it comes to his or her emotions. The friendship between an Aries and a Cancer may encounter problems in the way these two make one another feel all the time. 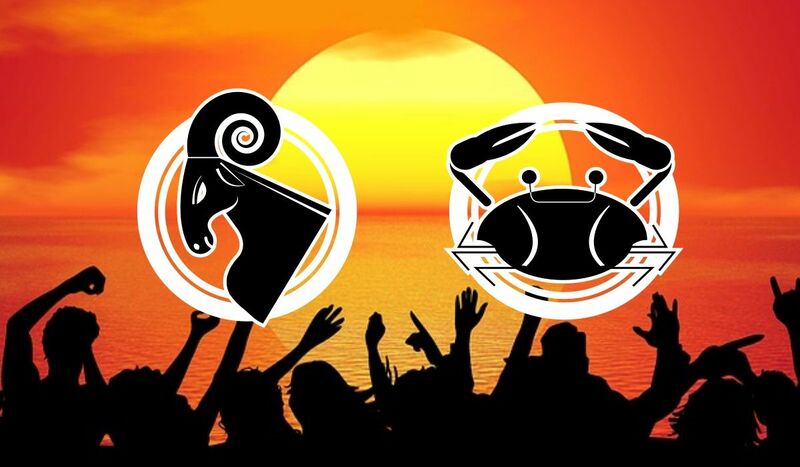 For example, the Aries can be a little bit too impulsive for the delicate Cancer, while the other way around, the Crab wants too much to stay at home for the independent and fun-loving Ram. While it can be fulfilling to spend time with someone as emotional as the Cancer, all this can become overwhelming when he or she can’t seem to get better after a difficult situation. The Aries will never have enough emotions to support a Cancer friend because the Ram is too honest and usually wants to speak only the truth, regardless of whom he or she is hurting. While the Ram is very independent and the Cancer capable of being the same as well, the latter sometimes needs support, which means the friendship between them can’t last for too long. It can be said they’re opposite signs because the Aries always acts on impulse and wants a lot of freedom, while the Cancer is calm and very sensitive. The Aries will always seem overwhelming for the Cancer because he or she has too much energy. While the second needs time to commit and to become loyal, the first begins to impose him or herself right away, which can be a pretty strong approach for the Crab. However, it’s also possible the Aries finds the contrast between him or her and the Cancer very interesting, but this doesn’t mean the Cancer’s moodiness will all the time be accepted by the Aries. Furthermore, the Cancer may think the Aries only wants to dominate. In order for these two to be best friends, they need to understand how different they are and how things between them can work in this situation. Both being cardinal signs, they can make great things happen because they know how to be leaders. The Aries doesn’t mind taking risks, while the Cancer is intuitive and can guess other people’s feelings. Therefore, it’s suggested for them to become business partners or to host many parties together. The fact that the Cancer is shy and the Aries very straightforward can keep the first protected, even if the Aries may begin to feel less enthusiastic when the Cancer has different guilt trips for no reason. If aware of each other’s strengths, they can be the best friends in the world, especially since the Cancer is highly nurturing and treats everyone as family. It wouldn’t matter what problem the Aries has; the Cancer will always be there for him or her and find a solution. However, the fact that the Crab hurts for long periods of time and for no real reason can make the friendship between these two a little bit difficult. People born in Cancer are known as very delicate and emotional, some being also exaggeratedly protective and too curious about their friends’ lives. When choosing their companions, Cancers are very pretentious and take their time to trust someone. While Crabs are attached to their home and very quiet, Arieses act as warriors who are always ready to take on a challenge. When the Aries will take care of the Cancer and protect him or her as much as possible, the Cancer will make sure the Ram is feeling comfortable and secure in his or her presence. It’s possible the Aries becomes overwhelming with his or her aggressiveness and the Cancer turns out to be demanding when it comes to what he or she expects from their friendship. The Aries needs to all the time reassure the Cancer of the fact that their connection is strong. Having great intuition and knowing when things are going bad, the Cancer can advise the Aries to no longer be impulsive and to make more realistic decisions. The Aries is ruled by Mars, while the Cancer by the Moon, which means the first is honest, direct and able to express emotions, something the Cancer truly admires because he or she usually hides feelings. The Cancer has only feminine energy and the Aries only masculine one, so the balance between them is more than obvious. The Crab doesn’t mind working from the shadows and hates being in the center of attention, while the Aries is the complete opposite. Furthermore, the Cancer could show the Aries how to be less enthusiastic and to appreciate patience more. The Cancer will never take the initiative for them to become friends because the Aries is more sociable and the Crab takes his or her time to decide whom to trust. Their friendship will encounter many quarrels because these two natives have different attitudes. For example, the Cancer will all the time complain about how the Aries can’t relax, can’t stick to a project or just analyze a situation. The Aries won’t accept and agree with the fact that he or she is wrong because people in this sign simply hate being criticized. When going out, the Cancer will try and save as much money as possible, while the Aries will spend everything on fancy drinks and exotic foods. When it comes for them to be business partners, they can work very well, but only if the Cancer is not in control because he or she is too emotional and generous. The fact that their elements oppose one another as one is Fire and the other Water means these natives have opposing energies and only a miracle can help them be very efficient as friends. It’s possible the Cancer will truly help the Aries become less impulsive and to control things more calmly, while the Aries can teach the Cancer how to open up and to become sociable. It’s important that these two talk about their friendship and keep a balance in their connection, especially if they want to be good friends for a lifetime. Some of them may find the companionship of one another very rewarding and a true revelation because neither likes to pretend and they’re both pretty honest with each other. These two are not like other friends, who pretend to have never met after coming from the club. Regardless of how different these two are because Aries is Fire and Cancer Water, they’ll always be honest with each other. It’s possible for them to have a lot of fun together as they’re both creative and neither of them wants to ever get bored. However, they need to pay attention to not become too passionate about what they’re experiencing as friends because this can make them unaware of other things. Friendship is important for both of them, and neither wants to impose him or herself on the other. Therefore, they both have the talent to cultivate their connection and to be great friends without needing to fake anything. The Aries usually makes friends for a lifetime because people in this sign immediately connect with others and don’t mind taking risks for their best friends to succeed. However, they’re always looking for interesting people and to be themselves helped in some way. It’s important to never make an Aries feel like he or she has the second place because natives of this sign are bossy, self-centered, competitive and possessive. Furthermore, they need to be stimulated all the time or else they decide to just look for new friends. Both the Aries and the Cancer are cardinal, which means they’re good at taking the initiative. However, these two need to agree on how they’re approaching life when they’re good friends because only through cooperation, they can become successful at what they’re trying to do together. The Aries is a natural born leader, so he or she may always try to control things. The Cancer is simply in control without even trying because people in this sign have great intuition and can guess what’s about to happen or what others are feeling. The more the Aries and the Cancer work as a team when friends, the more their common goals will get to be completed. It’s easy for these two to complement one another, so no matter what kind of experience life throws at them, they’ll always deal with it better when together than when on their own.